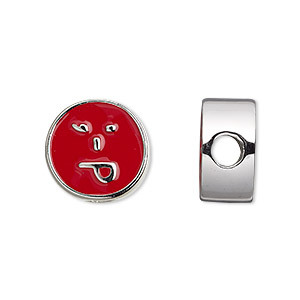 Bead, Dione®, enamel and silver-finished "pewter" (zinc-based alloy), red, 16mm double-sided flat round with playful emoticon face and 4mm hole. Sold individually. Item Number: H20-A1496MB Have a question about this item? 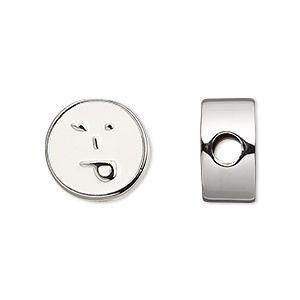 Chat-speak inspired emoticon bead includes a glossy enamel playful face. Bead, Dione®, enamel and silver-finished "pewter" (zinc-based alloy), black, 16mm double-sided flat round with playful emoticon face and 4mm hole. Sold individually. Bead, Dione®, enamel and silver-finished "pewter" (zinc-based alloy), white, 16mm double-sided flat round with playful emoticon face and 4mm hole. Sold individually. 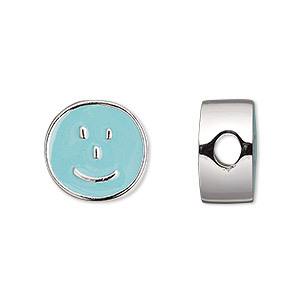 Bead, Dione®, enamel and silver-finished "pewter" (zinc-based alloy), aqua blue, 16mm double-sided flat round with smiley emoticon face and 4mm hole. Sold individually. 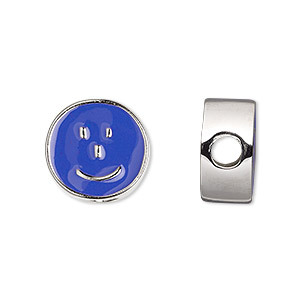 Bead, Dione®, enamel and silver-finished "pewter" (zinc-based alloy), purple, 16mm double-sided flat round with smiley emoticon face and 4mm hole. Sold individually. 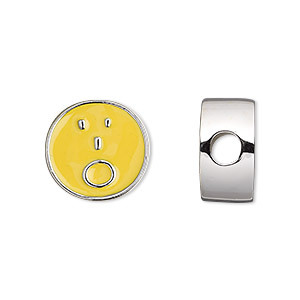 Bead, Dione®, enamel and silver-finished "pewter" (zinc-based alloy), yellow, 16mm double-sided flat round with surprised emoticon face and 4mm hole. Sold individually. Bead, Dione®, enamel and silver-finished "pewter" (zinc-based alloy), black, 16mm double-sided flat round with surprised emoticon face and 4mm hole. Sold individually. Bead, Dione®, enamel and silver-finished "pewter" (zinc-based alloy), aqua blue, 16mm double-sided flat round with surprised emoticon face and 4mm hole. Sold individually. Bead, Dione®, enamel and silver-finished "pewter" (zinc-based alloy), black, 16mm double-sided flat round with smiley emoticon face and 4mm hole. Sold individually. 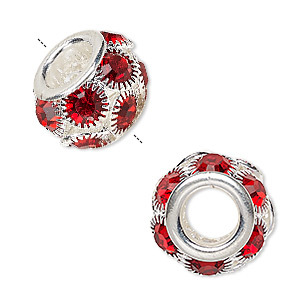 Bead, Egyptian glass rhinestone and silver-plated "pewter" (zinc-based alloy), light Siam, 18x12mm rondelle with 8mm hole. Sold individually. 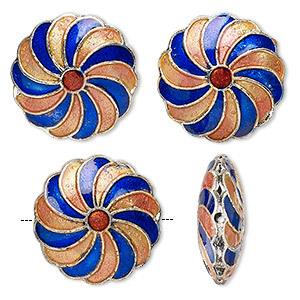 Bead, cloissoné, enamel and silver-finished copper, pink / cobalt / red, 19mm puffed flat round with swirl design. Sold per pkg of 4.